Next season is looking great. We have the best team we have had in years. LAFM: What has been your best season, and why? Last season because I got better. I want to get better every year. Calvin Johnson because we both love the long ball and can do amazing things with the fade. I started playing when I was 13 years old in Franklin. I plan on majoring in Biology and becoming a Dentist. LAFM: What positions are you being recruited for? I am being recruited for WR and that’s the position I play and love. LAFM: What schools are recruiting you, and do you have a favorite yet? 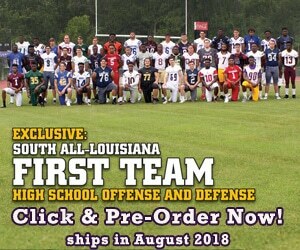 Louisiana Tech, LSU, Southern Miss, Mississippi State, and Northwestern. My favorite is Louisiana Tech because they are a passing team.